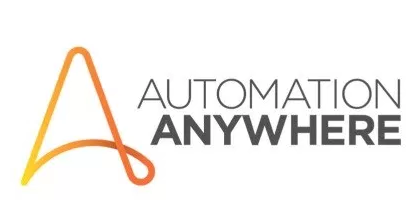 Automation Anywhere is one of the well-known RPA vendors giving great and easy to understand RPA abilities to robotize any mind-boggling errands. It is one of the “Progressive Technology” that progressions the manner in which the endeavour works. This tool joins current RPA with scholarly components like common dialect comprehension and perusing any unstructured information. Encourages you to robotize information exchanges and import or fare information between documents or applications. 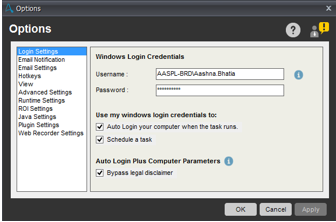 Auto-login runs planned assignments on whenever notwithstanding when the PC is bolted. What Process Can You Automate? 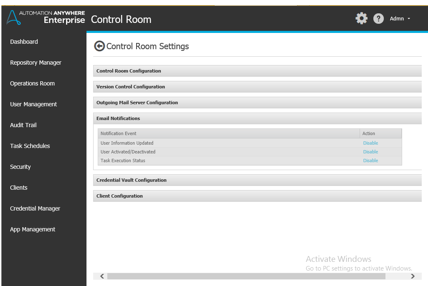 Automation Anywhere controls the computer through GUI just like a human user. 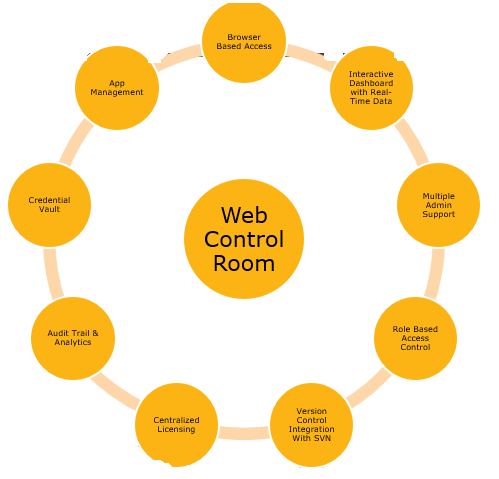 Control room- is a web-based platform that controls the Automation Anywhere. In other words, it’s the Server that controls Automation Anywhere bots. Source control: the control room manages code for the bots. So, it becomes clear to give the code over complex systems. Dashboard- • It gives comprehensive results of bots. i.e., how many bots are successful run and how many are failed, etc. 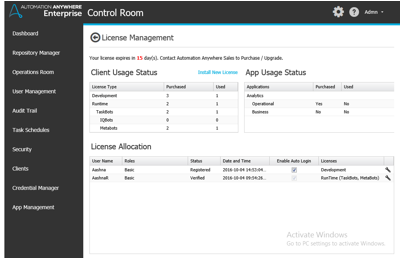 License Management: The licenses purchased are configured in the Control Room. Dev License: With this license, we can create, edit and run a bot. Run License: With this license we can run the bot but not able to make any changes. 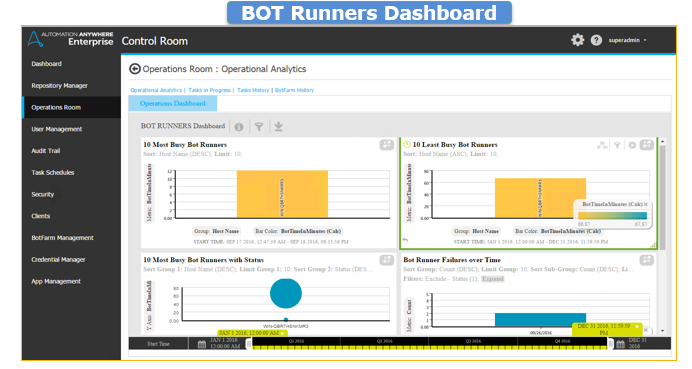 Bot Creator- Developers use Desktop based applications to build bots. On verification, the code of the bots they create is stored in the control room. Several developers may create unique tasks/bots. These bots could be mixed and performed at once. 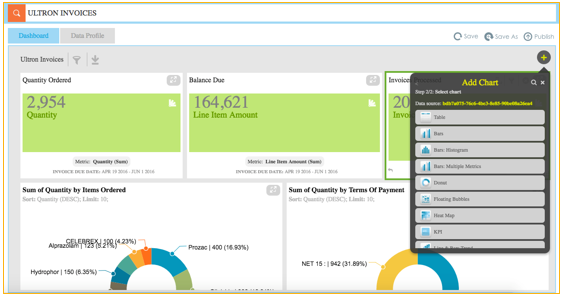 To assist you in designing and improving your business workflows, Automation Anywhere provides a Workflow Designer tool. The Workflow Designer helps you build Workflow flow diagrams in a graphical environment. 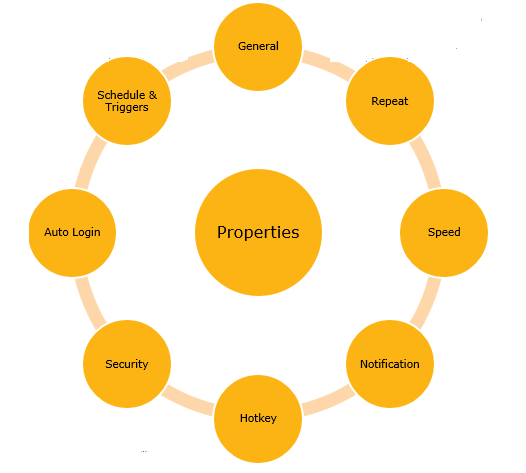 You can subsequently use these Workflow to build and run automated Workflows using Automation Anywhere. 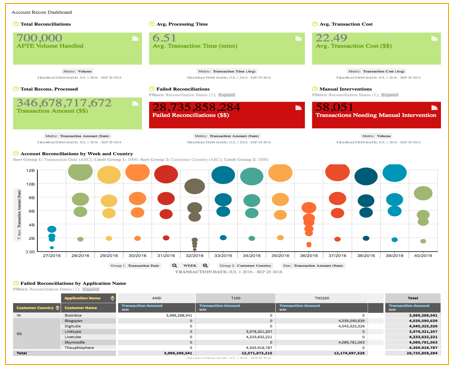 Automation Anywhere provides graphical reports that display the status of tasks and workflows, as well as the ROI over time. Task Run: Displays how many times a task has run successfully, and how many times it has failed during the period. Workflow Run: Displays how many times a workflow has run successfully and how many times it has failed during the period. 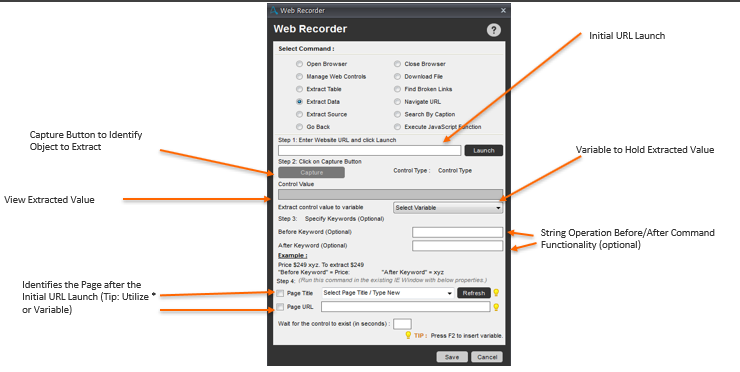 Screen Recorder is one of the three ways to create a bot. Requires to have a same OS and same Screen Resolution. Limited to static screens and simple desktops or web applications. Faster than creating a task manually. Status – Displays the last time the task was run. 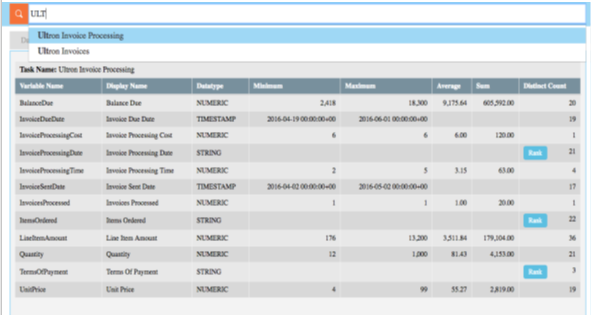 View Log – Click View Log to see historic and detailed status of the task. Last Run Time – Displays the last time the task was run. 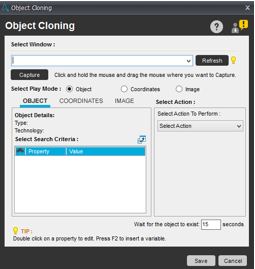 Mouse Clicks – Lists the total mouse clicks recorded in a task, automatically calculated based on the task. 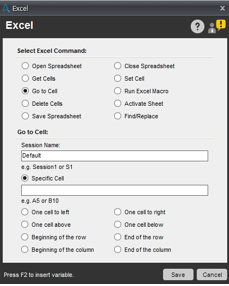 Keystrokes – Lists the total keystrokes recorded in the task, automatically calculated based on the task. Total Clicks – Lists the total clicks (Mouse Clicks + Keystrokes) recorded in the task. Priority for queuing – You can specify a priority for the task, which will decide the precedence of the task when it is in a queue. 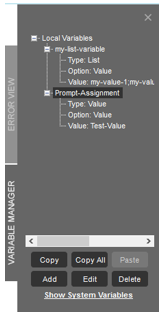 Timeout – You can specify timeout for the task to ensure that the task gets aborted automatically after the specified time. Timeout can be set only in minutes between the range of 0 to 9999. Enable this task to run with other similar files or window titles – By default, the task recorded will only run on the specific file(s) it was recorded on. However, SMART Automation Technology includes an option for running the recorded task on any file within the application it was recorded in. 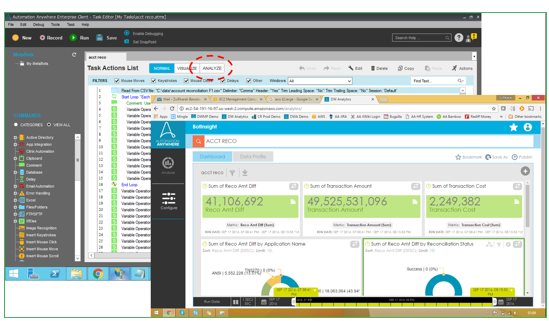 Automation Anywhere enables you to repeat a task that is scheduled to run. Do not repeat: The task runs only once. This is the default option. Repeat a number of times: Repeats the task a number of times, as specified in this field. Example: Repeat an email task 15 times to send 15 emails. Repeat until I Stop it: Repeats the task until you stop it by clicking the stop button or by pressing the ESC key. Use this option when you are not sure how many times the task needs to run. Repeat for hh:mm:ss time: Repeats the task for a time period that you specify. Time between repeats: Sets a duration of time to wait before repeating a task. Use the Speed property to adjust the speed at which a task runs. You can also view the duration in hours, minutes, and seconds that it takes the task to run. Standard Replay – The task runs at the same speed as when it was recorded. High-Speed Replay – The task runs at a faster speed than was recorded. Turbo-Action Replay – The task runs at the fastest speed and excludes any mouse moves. When planning to run your tasks, you can set up email notifications that are sent to one or more email addresses that you specify. In the Notification tab under Properties, select ‘Send email notification when task finishes’ and specify one or more email addresses. 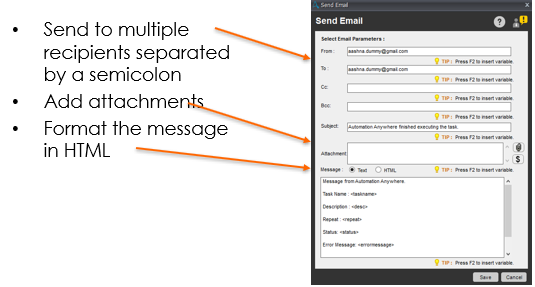 If you select ‘Send email notification when task finishes’ check box, but do not specify an email address. Automation Anywhere uses the email address that is specified in the ‘To:’ field in the Tools -> Options -> Email Notification. You can assign a hotkey to an automated task by using the Hotkey property. On the Properties tab, select Hotkey. 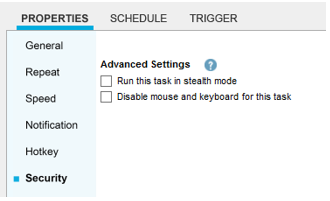 Running this task in stealth mode: Use this option to prevent information from being displayed on the screen while the task is running in Auto-Login mode. Disable mouse and keyboard for this task: Use this option to disable the computer mouse and keyboard while the task is running in Auto-Login mode. Auto Login must be completed to schedule or trigger a task. 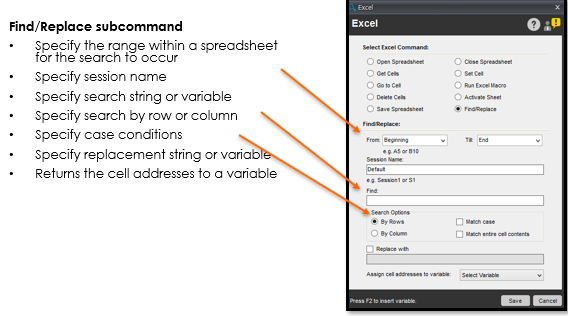 TIP: Use Variable Operation to populate all local variables. • To improve your ‘Before-After’ sequence command, ‘OR’ or ‘AND’ Logical Operators can be used. • Use the ‘AND’ operator to assure ‘After’ and ‘Before’ conditions. • Use the ‘OR’ operator to secure either ‘Before’ or ‘After ‘conditions. • Define the product of characters to be selected, starting from the first character after the Before keyword. • Used Join all the elements in a group of the variable into a single order. • It can be used only on a list of variables. • It provides the period of a defined string. • It Converts text to ALL lower case or ALL upper case. • This command is used to select the product of time a sub-string is followed in the source string. 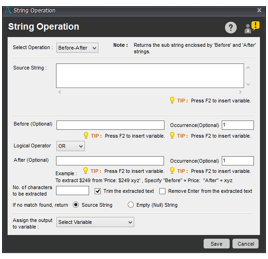 • It creates a unique string from the selected source string. • Used to assign an opening point for the current string. • Used to assign a length of the unique string. • Used to select source string into multiple destination strings. • Use a defined delimiter to decide where to split the string. • Select the number of generations a string is split. • Output must be in a file variable. • Used to remove extra spaces from a text string. • We can Trim from left or right. 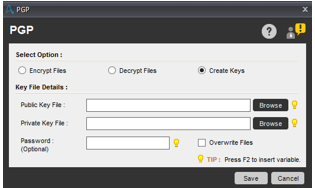 The PGP command helps you to automate the process of encrypting and decrypting files. PGP Passphrase: Requires a pass phrase to encrypt and decrypt. 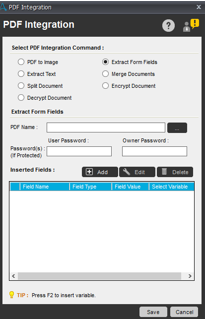 PGP Public/Private Key: Requires a PGP public and private key file to encrypt and decrypt. This command to create public and private encryption keys. You can add additional security to the keys by specifying a password that encrypts the keys. Helpful to catch Windows control features, such as buttons, text boxes, list box items, combo boxes, menu tabs, tables, check boxes. Once these are captured, particular activities can be implemented or can be allocated to changeable commands. 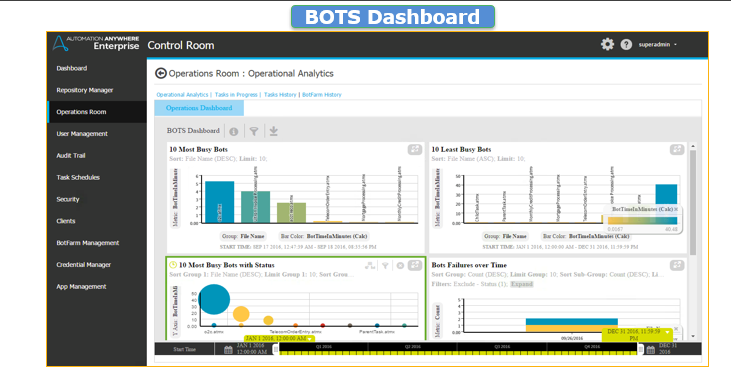 With web-based control room, it is permissible to monitor and manage massive multi-site complex automation infrastructure. Obtaining and operating assignments and Clients/Users from wherever. Monitoring assignment growth to strengthen internal compliance regulations, as well as to limit the critical tampering processes. Expedite a situation for progressed collaboration to increase productivity. Support scaling of multiple Users and machines. Expedite uploading and downloading of MetaBots and MetaBot enabled tasks. Expedite uploading and downloading of IQBots with Vision Skills. Configuration: – Use this option to configure settings for different components of the Control Room – Repository Path, Web Socket Service, and Control Room Access URL. Version Control: – To manage controlled edits of files that could include TaskBots, MetaBots, Reports and Workflows, you can enable and configure the Version Control Settings. 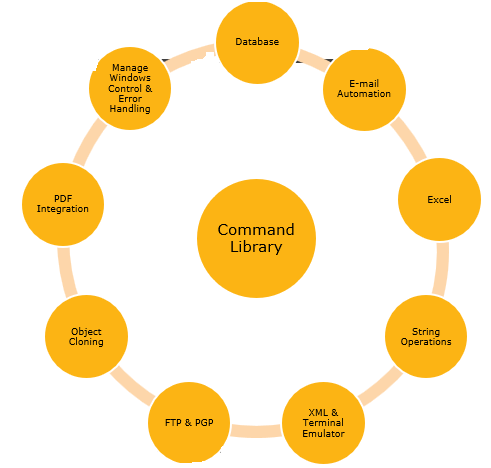 Outgoing Mail Server: – The configuration server that is used to send mail can be updated. You can update server details such as Server Email Id, Port number, User Name and From Email Id. Email Notification: – Email Notifications enables you to send notifications to Control Room users. You can opt to send these notifications by enabling any or all the ‘Notification Events’ available in the Email Notifications panel. Credential Vault: – The Credential Vault is a centralized location for securely storing credential information used in automation tasks. To configure settings for Credential Vault, a Super Admin has to choose between Express or Manual mode. 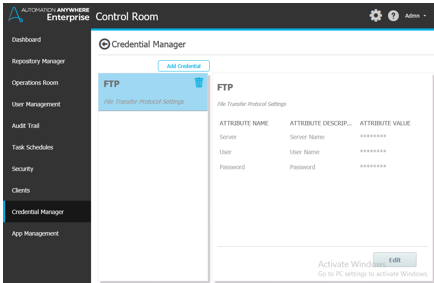 Express Mode – Use this to auto connect to the Credential Vault with the master key that is stored in the system during Control Room configuration. 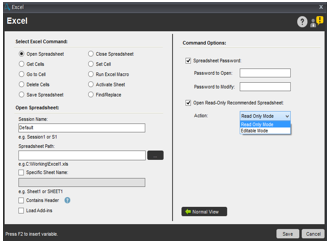 Manual Mode – Use this to manually connect to the Credential Vault using the master key that was available during Control Room configuration. 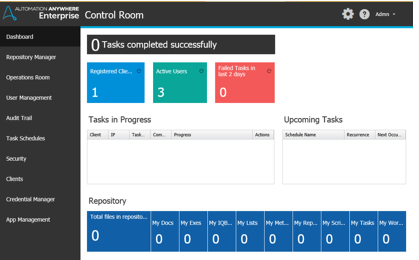 View task relevant activities such as tasks completed successfully, tasks in progress, , repository details and tasks, upcoming tasks that have failed on the control room dashboard. The most powerful capability that the Repository Manager provides is the ability to run and schedule tasks on ‘Runtime’ i.e. client users with ‘TaskBot’ privileges. 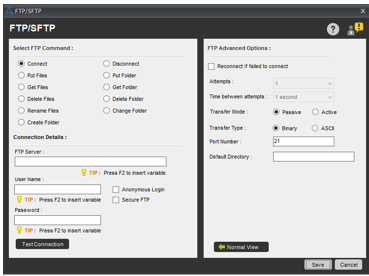 It also offers the capability to delete uploaded files to the Control Room administrator. 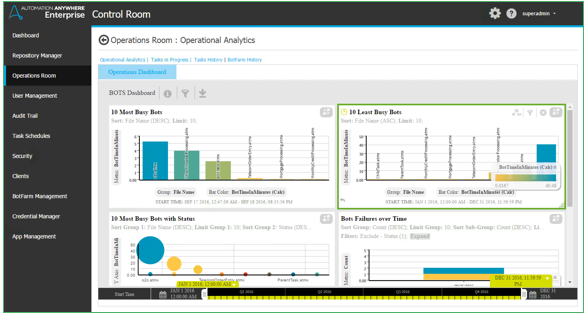 The Operations Room is a powerful monitoring console that provides detailed information about all automation on the network. Client User management involves creating users after defining specific roles as soon as the Control Room is hosted. These users can be either Non-Active Directory Users or Active Directory Users, as configured during installation. • Grants an administrator and user an essential data for observing task flow and status to internal observance regulations, as well as to limit tampering with critical processes. 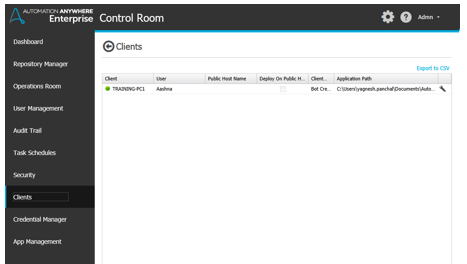 In Control Room, users with required privileges can schedule a selected task on selected Runtime Client(s) and also export the upcoming task schedule details to a CSV file. The Control Room Administrator can schedule tasks to play on Client(s) machines when Version Control is enabled in the Control Room. Activities and access to Control Room for Users (Administrators, Clients and non-Clients) are governed by the role defined for each. The role-based accessibility model ensures each User has console-access, to view information or data that is relevant to the role assigned by the Control Room Administrator. Roles & Permissions:- Admin, Basic, Bot Creator, and Bot Runner Roles are defined by default in the Control Room. 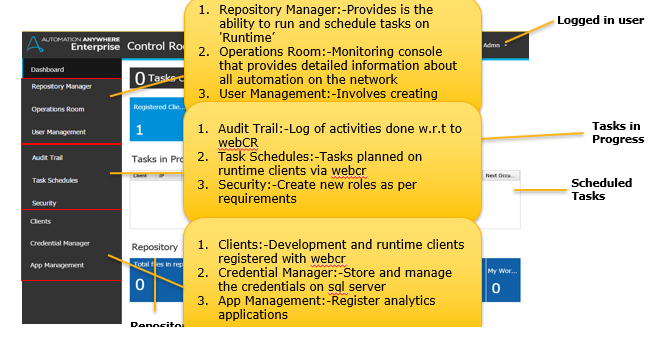 The permissions to these roles are also pre-defined and cannot be edited. 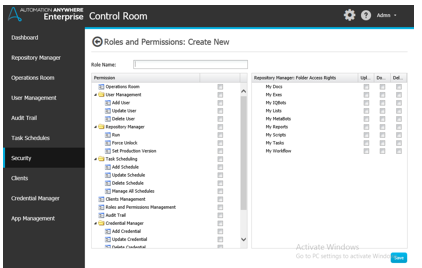 An Admin user is assigned the role of the Control Room administrator. A Basic role is assigned to users with access rights to the ‘My Tasks’ folder only with ‘Upload’ and/or ‘Download’ rights. A Bot Creator role has all folder access permissions. A Bot Runner role also has all folder access rights. The Credential Manager allows you to add a Credential Key and Attributes in the Control Room Credential Vault that can be assigned in commands as Credential Variables. 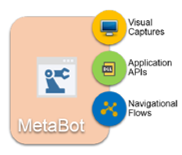 A MetaBot is an automation blueprint of an application that can be re-used to optimize processes. They help you standardize your processes end to end. 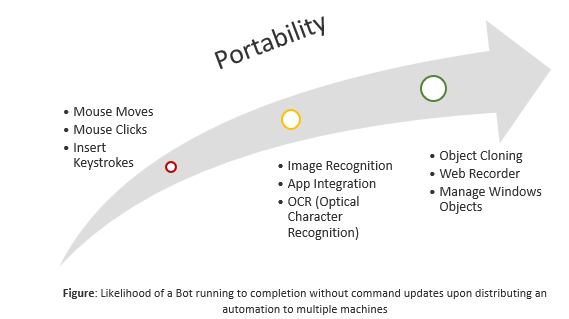 MetaBots enable you to create automation building blocks that capture information in the form of visuals or application APIs. These can thereon be integrated as commands and further leveraged by varied processes to deliver value at multiple levels. 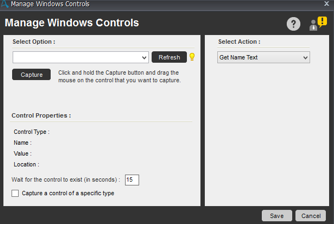 Visual captures (Screen) – These are GUI components (screens) of an application. In MetaBot Designer, a visual capture is referred as Screen. 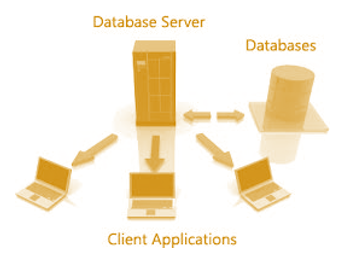 Application APIs (DLL)- These are interfaces that allow low level operations of an application by circumventing GUI. The MetaBot Designer also supports the most common format of API on Windows platform – the DLL. 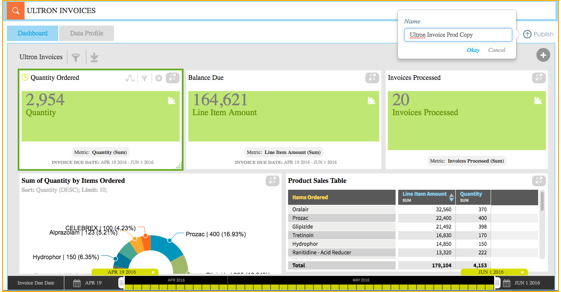 Navigational flows (Logic) – These are pre-configured use cases of an application and leverage Visual captures and APIs. In MetaBot Designer, Screens and DLLs form the Assets using which you can define and pre-configure any use case of a target application to create a navigational flow, known as Logic. Add Assets – Screens and DLLs to your MetaBots. Configure and Calibrate the Screens. Create custom objects on the Screens. 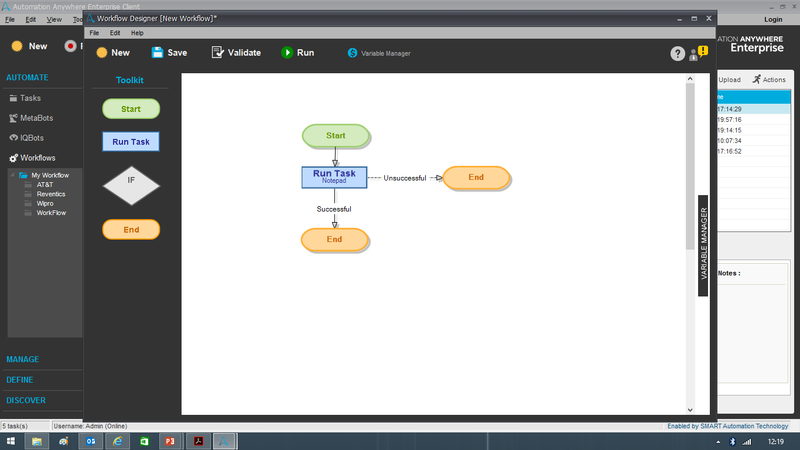 Create Logic to represent a navigational flow using Screens and DLLs. Upload the MetaBots to the Control Room for use by other Enterprise Client users. Edit MetaBots created by other users. 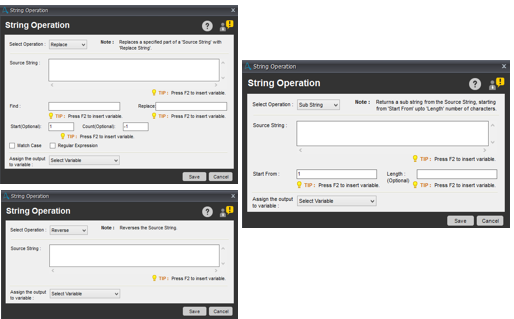 Export and Import MetaBots for use in different Control Room setups. New – Use this to create a New MetaBot. The MetaBot thus created does not include any Assets or Logic; its empty. You can start with either – ‘Record Screen’, ‘Add Screen’ or even ‘Add DLL’ based on the purpose for which the MetaBot needs to be created. Record – Record is an alternate method of creating a MetaBot. Here, at-least one MetaBot will be present as its recorded. My MetaBots – This tab is shown by default; it displays all MetaBots. This tab is always open, by default. Configure –use this to edit your application properties for the recorded/added screen. 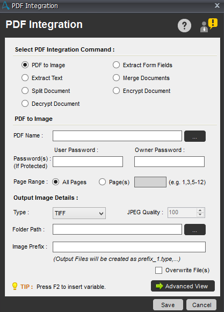 Upload – This is use to upload MetaBots to the Control Room for downloaded by other users. 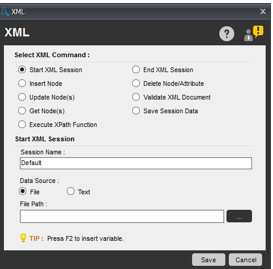 Delete- This is use to delete MetaBots, Screen and Dlls. Export/Import –This is use to export and import MetaBots for use in different Control Room setups. 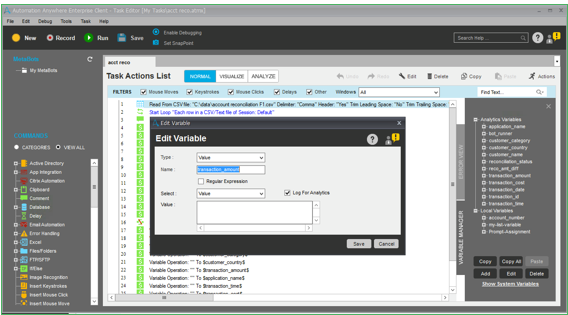 Create Analytics Variables marked with “Log for Analytics”. 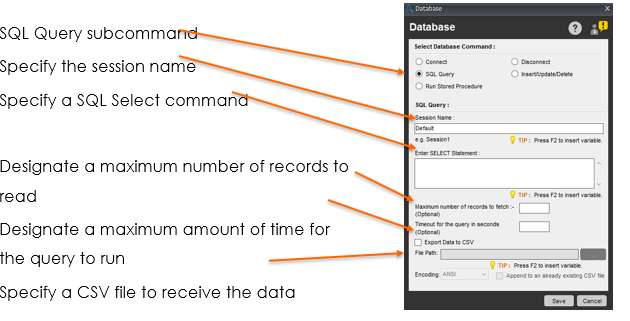 We Can include system variables, transaction counts. This is the default dashboard. Under “Configure” hood the “Data Profile” tab shows the Analytics variable in details with their types. The type is recognized based upon the data stored in variables. We can add more widgets, filter, compare over time etc. We can Customize content and visual charting. 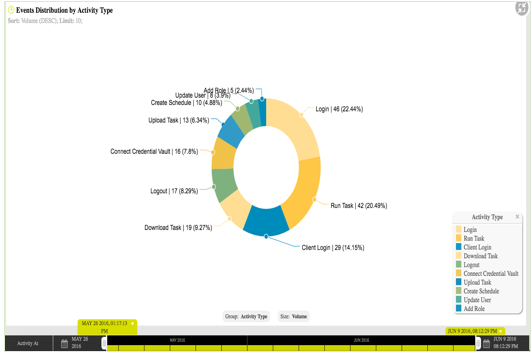 Once the dashboard is ready, it can be published for analysis. 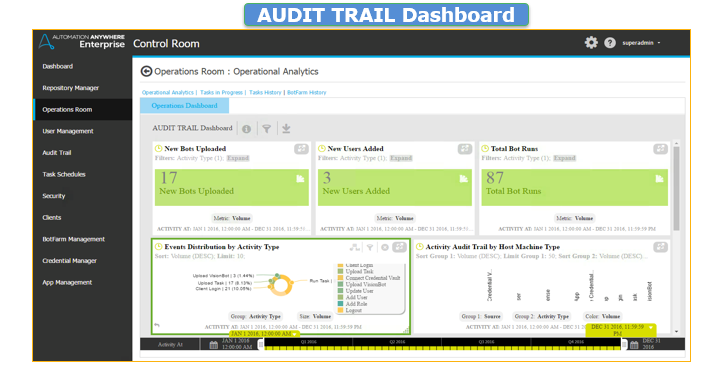 The public dashboard can be later viewed by the analytics consumer users also. 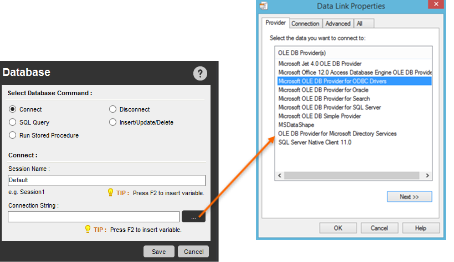 Enable ‘Enable Analytics’ checkbox for task. One mandatory variable of type numeric with/without decimal place. Assess and tighten security and access protocols.